Visit our Refill Station to fill your reusable bottles with zero waste household cleaners, body care products, and bulk goods from sustainable sources. Sustain LA Refill Station has the solution to expensive and excess product packaging! We’ve recently launched the first Refill Station for household and body care products in Los Angeles. Furthering zero waste practices for your everyday life, come refill or find in bulk all the best of your daily necessities here - soaps, shampoos, conditioners, cleansers, ingredients to DIY - all available together, in one convenient location. Bring your own refillable containers, and check out ours while you're here! We feature an expanding selection of curated zero waste products to help you on your journey, some of which you can find online. 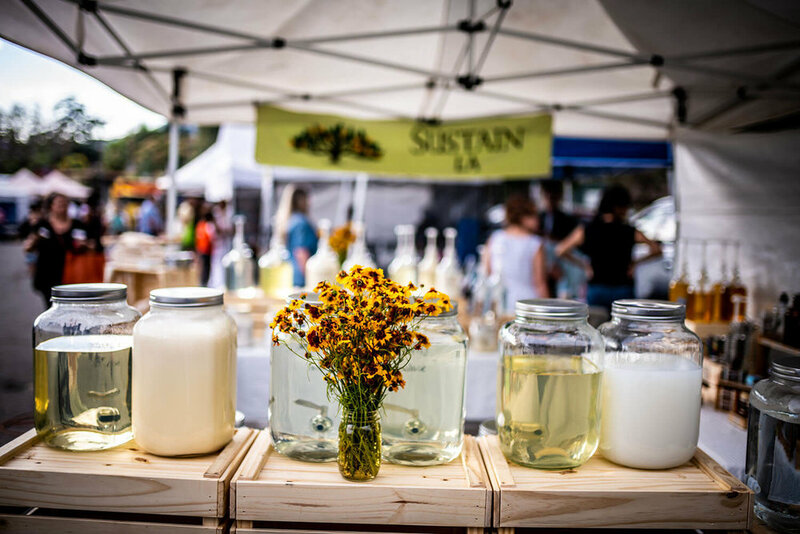 While we're busy prepping our retail location in Highland Park, the Sustain LA Refill Station can be found alternating weeks at the Highland Park Farmers' Market and the Altadena Farmers' Market. You can also find us every second Saturday at MooShoes LA in Silver Lake, every first and third Sunday at the Atwater Village Farmers’ Market and every second and fourth Sunday at the Hollywood Farmers’ Market. See our calendar below for additional markets and pops-ups, and follow us on social so you don’t miss an opportunity to make your zero waste dreams come true! We now offer SLA Refill Station products delivered to your door! Find out more and place your order here. Follow us & catch your next chance to refill! Our ZW Living products can also be found here. Transparency in ingredients is our starting point. We source products from companies with a commitment to environmental stewardship and plant-based, natural ingredients. Many of our products have third-party certifications (Vegan, Leaping Bunny, Organic, Non-GMO Product Verified) and a full ingredient list is available at every market and pop up. EWG’s Skin Deep Database has been our family’s resource for researching products, ingredients, potential hazards and health concerns, and we’ve transferred that methodology to the Refill Station. We also take into consideration product miles traveled and availability of bulk purchases and minimal packaging options. Less packaging = less waste. We are proud to support small production, regenerative farmers and numerous woman-owned businesses. Follow our blog for highlights of the companies we love to work with.